Whisk together the brown sugar, olive oil, balsamic, soy sauce, lemon pepper, thyme, basil, parsley, and garlic powder in a bowl, and pour into a resealable plastic bag. Add the salmon fillets, coat with the marinade, squeeze out excess air, and seal the bag. Marinate in the refrigerator for at least 1 hour, turning occasionally. Preheat an outdoor grill for medium heat, and lightly oil the grate. 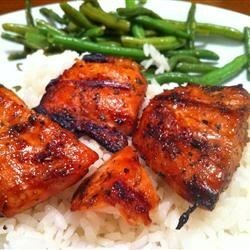 Remove the salmon from the marinade, and shake off excess. Discard the remaining marinade. Grill the salmon on the preheated grill until browned and the fish flakes easily with a fork, about 5 minutes on each side.